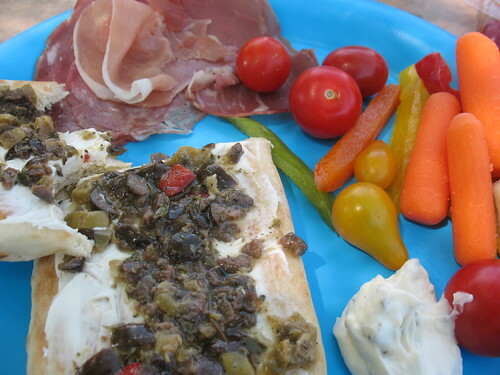 Road Trip Food: A How-To, With Recipes! This summer I was on the road for 32 days, covering ten states, in three different vehicles, and went over 15,000 kms. While it was loads of fun and I enjoyed every second, there also was one major challenge. Road trip food is generally not that great, I'll admit. You end up taking just whatever you can get, and after awhile all the restaurant menus begin to blend together. Even though we vowed not to eat fast food, by about the 15 day I was ready to chuck a restaurant menu across the room and wail in protest. Plus I was really, really sick of bacon. How did we survive that many days on the road? Each trip was unique, as it was by a different vehicle and had different travel companions-so I'll break it down for you, by the trip. Destinations: Montana, Oregon, Colorado, South Dakota, Utah, Idaho, and more. The trip was to spend time 4x4ing in Utah, gold pan in South Dakota, and spend lots of family time together. Plan of attack: Eat at hotel breakfast bars, pack our own lunch and snacks, eat dinner at restaurants. This vacation was where I cooked the most. We loaded up on dry goods like cereal, crackers, hummus, and more before we crossed the border into the USA and hit a grocery store for more perishable items. I had packed a bag with a tupperware that contained all the hotel room cooking items I'd ever need: a peeler, small cutting board, knife, ice cream scoop, wine bottle opener, can opener, small jar with lid for making salad dressings, a few measuring spoons, salt and pepper). In the bag I also had a great plastic colander and single serving sized containers with lids. Chop up all the veggies (leave out the egg, tuna, cheese) the night before and toss in the large tupperware that you are storing all the cooking utensils in. Divide into smaller single serving containers and put in the fridge. Grab the eggs in the morning at the breakfast bar before you leave and put in a single serving container. Pack everything in the cooler. **be careful-hotel fridges notoriously freeze everything! Make sure to pack the olive oil and balsamic close to where you can grab it when you pull over at a restaurant and want lunch, along with a small jar, the lid, and a tablespoon. 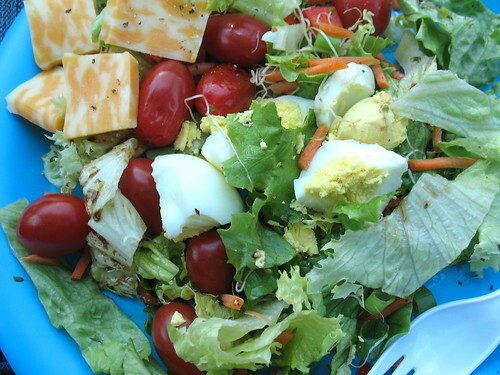 When you are ready to eat, dump the salad onto a picnic plate. Add the eggs and cheese slices. To make dressing, shake 3 Tbsp of olive oil with 1 Tbsp of balsamic vinegar, plus a little salt and pepper. Drizzle over top. Toss everything in a bowl, drizzle with the dressing. Season to taste. Then divide into single serving sized containers with lids. The problem with sandwiches when you are traveling is that mayo is hard to keep cold. Give your sandwiches some 'sauce' by mashing up avocado into them instead. Slice the avocado in half, take out the seed in the middle, then spoon it all out into a bowl and mash. Slice the lime in half and squeeze in the juice, and add some salt and pepper to taste. You cold also add chopped garlic and a little jalapeno if you want some spice. 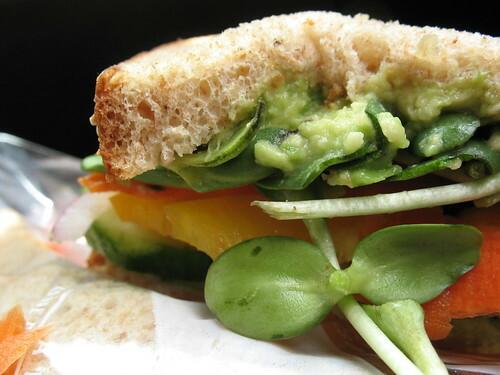 Spread the avocado mixture on a piece of bread, then begin layering the other veggies. Spread more avocado on another piece of bread and sandwich together. Wrap them well and keep in the cooler until ready to eat. This trip was the most difficult, mostly because we couldn't carry any food on the bike and were completely at the mercy of restaurants. We employed a lot of strategic ordering, to the point where we'd ask how big items were, and had no difficulty asking for sauces on the side, fruit/salad instead of fries, half orders, and would resort to the seniors/kids menus if we needed too. Also sometimes getting an appetizer instead of a full meal is a great option. Destinations: Washington, Oregon, California to go to Blogher 2011 in San Diego. As far as restaurant free vacations go, THIS was the most successful. Appointed the Director of Noms for the duration of the trip, I was expected to provide cookies, and wrangle the food for the 4 of us. While at first I planned to cook, things gravitated in a different direction. Instead we all settled on grazing, which turned out to be wildly successful. Eating this way rather than in a sit down restaurant required a little time and forethought, but I think that all of us felt well fed and happy. The extra bonus was the ridiculous amounts of money we saved-for 7 days, we spent just under $60 each on food for four people. Crazy, huh? Plus it was ridiculously good food. I plan to employ this strategy more with my family on our road trip next year. A few days, we bought individually packaged pre-made salads, which are all fresh and come with a dressing that has only real ingredients, then supplemented them with the cheeses and meats. Trader Joes does this wonderfully, and we enjoyed just nibbling all the tasty goodness. We had a great plug in cooler which helped enormously-not just with being able to keep the food cold but protect it from overzealous hotel fridges. Packing along our food not only saved us money but some of the most fun of the trip was stopping at various locations along the road for a picnic. There aren't any Trader Joe stores in Canada, but you can likely replicate this by stopping at other local grocery stores. I highly recommend mapping out your trip and then researching via Google maps the stores along your route, so you don't get lost and waste time looking for them (although we still did a few times). All in all, it was a delicious trip. I even did a final shop at Trader Joes to bring a bunch of the tasty goodness home to my family.